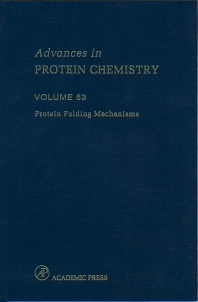 This volume of Advances in Protein Chemistry is devoted to protein folding mechanisms. Some of the topics covered include: autonomous protein folding units, barriers in protein folding reactions, the role of molten globule state in protein folding, comparisons of equilibrium and kinetic approaches for determining protein folding mechanisms, the relationship between sequence and structure in elementary folding units, and the energy landscape theory of protein folding. Biochemists; molecular biologists; cell biologists; and biophysicists.